With the start of the trading week on Monday, find the Friday candle. On a 4H chart find the high and low of the Friday candle. - Set BUY STOP order 10 pips above the high. 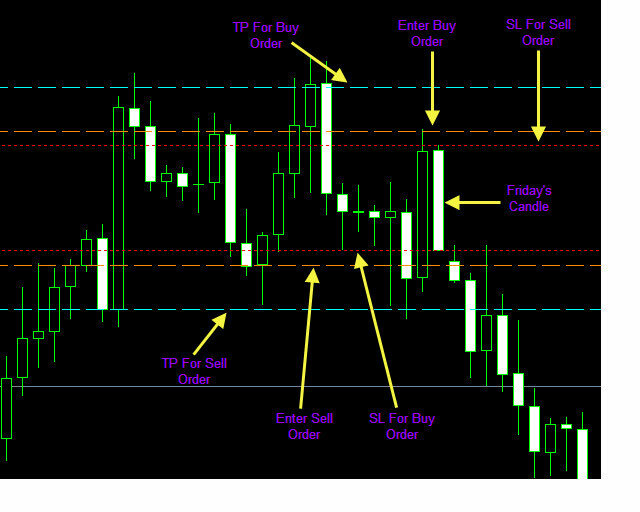 - Set SELL STOP order 10 pips below the low. - For long trades the SL is the Friday candle low. - For short trades the SL is the Friday candle high. - Set SL to break even once your profit has reached 2x your SL. So if the SL is 32 pips, you should set trailing stop of 64 pips. - Your TP is the weekly ATR (14) Value (every 1000 = 10 pips). o If one of the trades was taken and reach his TP – cancel the 2nd order. Don't get scarred from the example above, it's actually very simple. candle high and one sell stop order 10 pips below (Magenta lines). set the SL at the candle's high (Red dotted lines).